All Gokito (private ceremonies) are by reservations. Please email or call us. Hawaii Kotohira Jinsha – Hawaii Dazaifu Tenmangu is a 501(c)(3), domestic non-profit entity. All contributions are tax deductible to the fullest extent allowed under the IRC. From East Oahu: Take H-1 heading Ewa (West) . Exit at 20-B Houghtailing. will be the first building on your right. School. Take a left at the intersection of North King and Houghtailing. 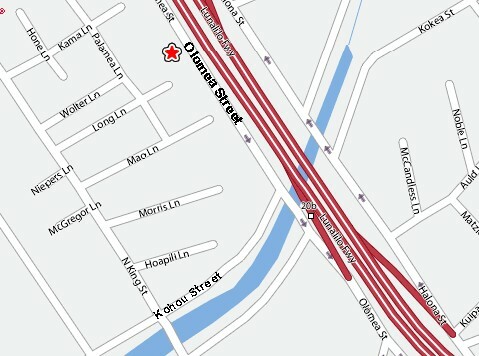 Express A (Westbound): Get off at 7-11 Kapalama (near the Kapalama canal). Walk towards the west. Turn right at the 5th street (Kama Lane). The shrine is at the end of the street. Approximately 5 minutes from the bus stop. #1 (Westbound): Get off at Honolulu Ford on the corner of North King and Houghtailing. Walk towards the East (back towards Diamond Head). Take a left at the first street (Kama Lane) The shrine is at the end of the street. Free parking is available in the shrine lot or on Olomea Street.